The future has arrived and it is electric. If the 41st Tokyo Motor Show is any guide, major car manufacturers are taking the race to build eco-friendly machines — electric, hybrid plug-ins and fuel cell vehicles — seriously. Our World attended today’s media-only preview and we were surprised to find that green technology was the focus of both the manufacturers’ official press briefings and the throngs of media that attended. 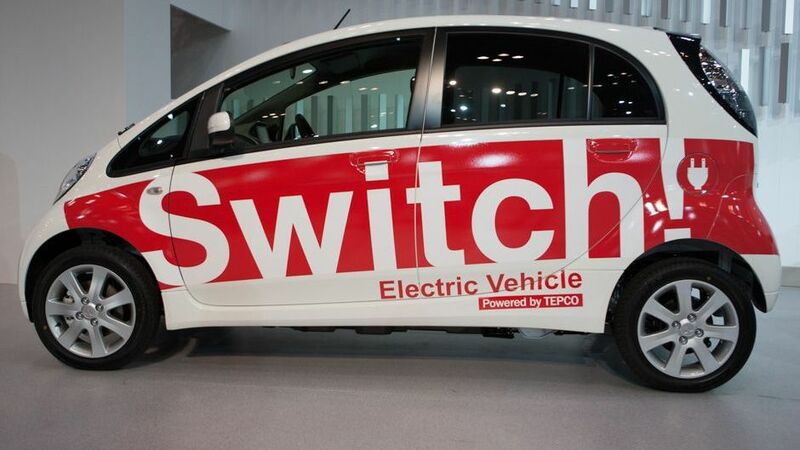 Car giants Toyota, Nissan, Honda and Mitsubishi all led their presentations with promotions of next generation vehicles, responding encouragingly to this year’s theme “Fun driving for us, Eco driving for Earth”. Our mission was to find out who is really driving change when it comes to eco-friendly vehicles, and who is just going along for the ride. We expected Toyota’s unveiling of two new “green” concept models to be the highlight of the day, and it seemed that everyone else did too. The whole show virtually shut down as the crowd shifted to the Toyota display to hear Akio Toyoda, company president and grandson of the company’s founder, speak. Toyoda unveiled the FT-EV II concept car — a small four-seater electric vehicle that can run 90 km on a single charge — and for the more fashion conscious, the new FT-86 reduced emissions sports car was launched to the sounds of piercing rock music. In a story familiar to enthusiasts of alternative vehicles, these models are still just “concept cars” and the reality of their mass production is by no means secure. Potential buyers will have to wait until the end of 2011 (Japan and US) for the FT-86, and until 2012 (US) for the FT-EV II, before they can turn the keys over. To its credit, Toyota has been walking the talk much better in the hybrid category, despite record losses this year resulting from the financial crisis. Sales for its well known third generation Prius have accelerated tremendously in recent years, especially in its home country, Japan. On the one hand, it feels like Toyota is leading the race for the vehicles of the future. However, the president mounted a strong defense of cars and stressed that gasoline based vehicles are still an important part of the company’s overall portfolio. In contrast, Nissan left the media pack with no doubt as to where its business is headed as it trumpeted its commitment to the environment through its “blue citizenship” strategy. The turbo-charged presentation by Nissan’s first non-Japanese company president, multilingual Lebanese businessmen Carlos Ghosn was undoubtedly the surprise of the day. Nissan, in partnership with auto-industry companies and governments, appears to have a clear long-term strategy to roll out its green cars across the world. 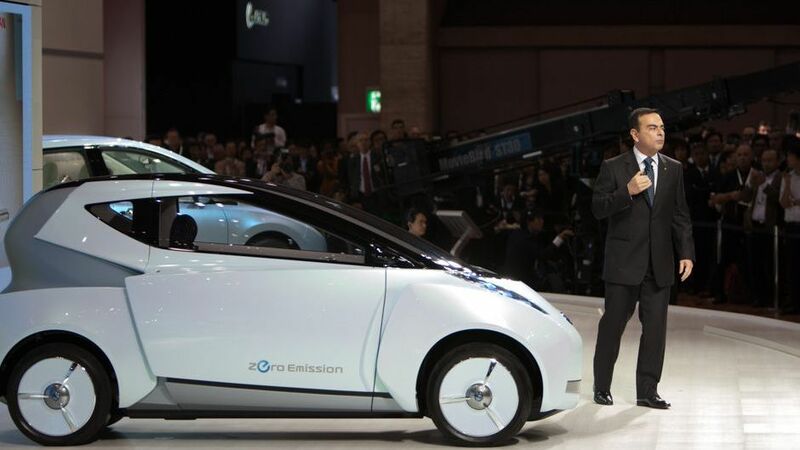 Ghosn cleverly articulated his company’s “international commitment” to reduce emissions by plugging its range of new zero-emission vehicles, obviously playing to an international audience as the only one of the major manufacturers to present in English. The company claims that the nature-invoking Leaf sedan will be the first “mass marketed zero emission and affordable” car on the market. Made from recyclable materials and with the capacity to travel 160 km in a single charge, it will be available for purchase from 2010 in the US, Europe and Japan. Nissan also unveiled a slim-lined futuristic one-seater electric vehicle, the Land Glider, complete with tilting wheels and its own recyclable lithium-ion batteries, produced in its joint venture with electronics company NEC. 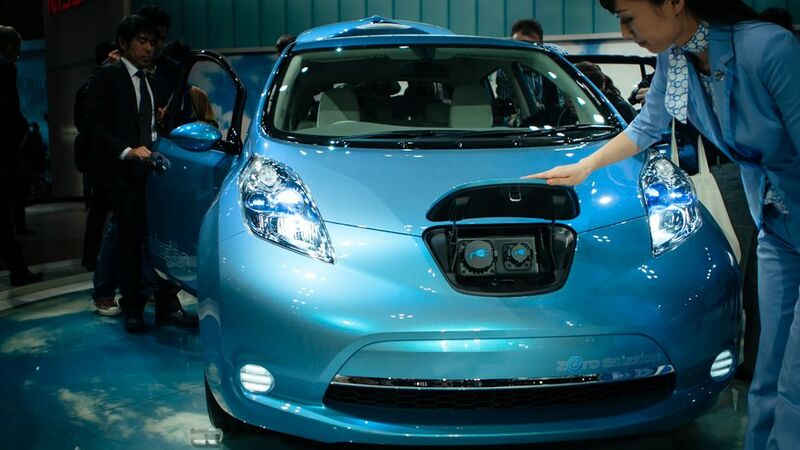 In his speech, Ghosn claims that the Renault-Nissan Alliance is investing over US$ 5.5 billion in zero emissions vehicles, suggesting that it is serious about environmentally friendly cars and hopefully ready to make up for its slow entry into the green car market. Today’s displays highlighted that the major manufacturers still have different views on what the best technology to invest in for the future is. While most companies were focused on electric vehicles and hybrid plug-ins, Honda focused its stage production on hydrogen fuel cell cars, confirming its determination to create what its president calls the “ultimate form” of alternative fuel vehicles. Honda spoke of the “power of dreams” but in reality, its strategy to promote various “mobility devices” through its Honda Electric Mobility Loop (see page 4 of this PDF) seems incoherent. Details were also unclear on the company’s showpiece display model, the FCX Clarity, which began selling in very small numbers in the US in 2008. Only 200 vehicles have been produced in three years. While most of the major car-makers had at least concept models on show, Mazda chose instead to promote fuel efficient gasoline based cars that use its new “i-stop” technology which shuts down and starts up a vehicle’s engine automatically in order to save energy. The big three US automakers — General Motors (GM), formerly the world’s largest manufacturer, Ford and Chrysler — were all missing from this year’s show, even though all of them appeared at the last Tokyo Motor Show in 2007. There is speculation that the financial crisis or the Tokyo show’s declining global importance might have been a factor in their absence. Or perhaps it’s because they are well behind in the race to build affordable and fuel efficient alternative vehicles (see comparisons here)? As we have seen however, affordable electric car dreams will come true in the US next year thanks to major Japanese manufacturers. Perhaps the falling US giants are still recovering from their role in delaying the proliferation of new automobile technologies, as the provocatively titled documentary “Who killed the electric car?” asserts. A decade ago, the Detroit-based GM ended production of what was considered to be the world’s first mass production electric car built by a major manufacturer — the EV1. Although to be fair, it did make the 50 Worst Cars of All Time according to Time Magazine for legitimate reasons — it was expensive to build and the battery technology was not yet ready. Ten years and one financial meltdown later, GM is struggling to get back on its feet after being bought out by US taxpayers earlier this year. Perhaps this provides the US government with the perfect opportunity to develop serious alternatives to unsustainable gas guzzling Sport Utility Vehicles (SUVs). This, like the presentations we saw today, sounds good in theory. But let’s face it, car manufacturers have been revving their engines on electric vehicles for several years, without really moving out of first gear. Today’s display of the latest model of the Mitsubishi Innovative Electric Vehicle (MiEV), first developed in 2005 and finally available to the public in 2010, serves as a reminder that the technology is far from complete and therefore mass consumption is a long way off. Still, the overwhelming vibe we got from this day was that manufacturers are seriously investing in environmentally sustainable vehicles and in the process, investing in their own long term future. The Future is Electric by Sean Wood is licensed under a Creative Commons Attribution-NonCommercial-ShareAlike 3.0 Unported License. Nice work gents. The biggest mistake Ford ever made was letting go of Jacques Nasser in 2001. Nasser and Ghosn, the Lebanese connections!!!!! Mr. Kengo Kuma, Japanese architect, says that restriction is a treasure of creativity. We can see real creativity in the current automotive sector! b) on the other hand, some of the industry people are getting defensive about big, guzzling petrol cars using a strategy of criticising hybrids for their “problems” with things like space, comfort and safety. Perhaps this is a signpost to a future where true market forces drive people towards hybrids for economic reasons earlier than some are prepared for. If the market were left to speak for itself, this trend toward utilizing sustainable methods in automotive manufacturing would have happened years ago, yet due to artificially inflated prices (it was the Big Three who bought out and then dismantled the public railway transportation in the 1950s in Los Angeles-and many other U.S. cities- while putting pressure on Eisenhower to build highways in order to create a massive customer base for their product) and extremely shortsighted infrastructure funding practices, we are stuck with a 160 year old technology, even the electric hybridization of which is not a true step forward, but rather a stalling tactic on the part of a vastly entrenched fossil fuel lobby with its slimy tentacles reaching deeper and affecting more aspects of all of our daily lives than we know. In Taxi-crazed Tokyo a few companies have bought into the Prius, which is better than nothing…for now. The real question is when will the electricity used to power the cars actually be created in a sustainable way, as opposed to burning coal to crate the dirty electrons we currently employ? When governments stop subsidizing the short term dirty power sources for the benefits of the few and start investing in long term solutions to create sustainable and renewable sources of clean electrons which benefit the world at large, only then will we be able to believe what we see when the “Big 3” and all the other (morally) bankrupt manufacturers dust off the old electric car designs with mini-spoilers and shiny new gloss coats at next year’s auto show, that is to say, should Odaiba be enough above sea level to host it. this is total prolification of Japanese Car Companies. Well Obama is not the first to say that everything was invented by americans. The first thing that came to my mind is the invention of the telephone. At least he admits we failed. Not that that makes any difference.